There are few things more confusing to new anglers than shopping around for a fly rod. For better or for worse, high technology has struck the fly rod market. And with it has come a wild assortment of high-tech sounding names, none of which make much sense to new anglers. An Orvis Clearwater Fly Rod, which is an excellent fly rod for beginners and intermediates anglers and is available in a combo package, too. More info at Amazon. So, in an effort to break free of this confusion, I've prepared this buyers guide to fly rods. Hopefully, after reading this article, you'll walk away with a better idea of what kind of fly rod to get, and why. And just as importantly, you won't have "buyers remorse" three months after purchasing the fly rod. If you would like to spare yourself some reading, I've listed some quick recommendations below on features most beginner anglers will want to look for when shopping for a fly rod. How to Select a Fly Rod - The Complete Guide to choosing a fly rod (for the geeky). For new anglers, get a medium-action fly rod. They are the most versatile of fly rods and are pretty forgiving to learn on. If you want to know more about fly rod action, read the How to Select a Fly Rod Guide. Make absolutely sure that the weight of the fly rod matches the line weight you plan on using. And likewise, make sure the weight of the fly rod matches the weight of the fly reel you plan on using. Read the How to Select a Fly Rod Guide for more information about this topic. If tip #4 is confusing, then remember this formula: fly rod weight = fly line weight = fly reel weight. New anglers don't need a $700 rod. However, cheap fly rods perform poorly and will quickly prove frustrating to new anglers. Beginners should look at fly rods in the "mid-range" in terms of price. This way, you'll have use of this rod for many years with no worries of quickly "outgrowing" it. For new anglers, one excellent choice is the various Orvis Clearwater Fly Rods that are available. They last forever and anglers will not quickly outgrow them. Here's some good brands of fly rods : Cabela's, Orvis, Sage, G. Loomis, Winston, Redington, Fenwick, Scott & St. Croix. The above list is by no means exhaustive. Many other fine fly rods are made.These are just the ones I'm familiar with. Choosing one of the mid-priced rods in any of those above brands will prevent new anglers from buying something that is quickly outgrown. Plan to travel frequently? If so, consider getting a fly rod that packs into 4 or more pieces - they are far easier to travel with. These rods are frequently called "Travel Rods", appropriately enough. There's such a dizzying variety of fly rods available, new anglers - and even experienced ones - can get "turned around" when deciding what to get. Because of this, when shopping for a fly rod I've found that is often best to "eliminnate" what you don't want first - which greatly shortens the list. For all anglers, remove anything from the list that sells for less than $100. Those fly rods are $100 or less for a reason. While the ultra-cheap fly rods work well enough for the kids and for chasing panfish in the local pond, for wild trout fishing in Montana....forget it. Beginner anglers will also want to strike off their list any fast-action fly rods (explained further in the How to Select a Fly Rod Guide). Fast-action fly rods aren't the best to learn on, and also lack the small stream flexibility that slow-action and mid-action fly rods provide. By and large, most new anglers will want to go with a mid-action fly rod unless the bulk of their fishing will occur on very small streams (in which case a slow-action fly rod may be a better choice). New anglers will also want to remove all real expensive fly rods from the list, too. While there are most definitely performance improvements between an "intermediate priced" rod and one that costs $400 or more, new anglers will not notice the differences. Finally, new anglers who are "starting with nothing" in terms of fly fishing gear almost certainly will want to buy what is known as a "Fly Rod Combo." A fly rod combo contains a perfectly matched and balanced fly rod outfit. A fly rod outfit consists of the fly rod, the fly reel and the fly line - usually along with a fly rod tube/case to carry it all. Moreover, the price savings on fly rod combos is often significant compared to buying individual pieces separately. The Orvis Clearwater Fly Rod (and related combo that includes the line and reel, which is also available) is ideal for beginners. Beginners will be in no rush to upgrade from this combo (I still have mine and use it often). Other good combos for beginners and intermediate anglers are available from Cabela's, St. Croix, Sage, and G. Loomis. Offline, any quality fly shop should have a good selection of quality fly rods from various manufacturers. Just stay away from buying a fly rod or fly rod combo from a big box store, as the rods/combos sold here are almost always of very poor quality. 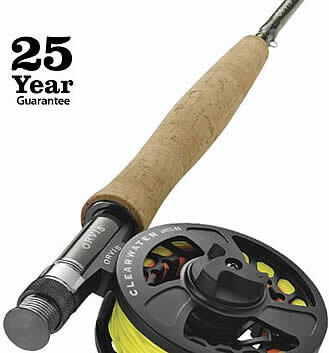 Orvis Fly Rods at Amazon- Orvis has an excellent selection of fly rods for all budgets. One nice thing about Orvis, even their entry level line of fly rods (the Clearwater Series) are excellent rods and come with a 25 year guarantee. In short, you won't find a junky fly rod made by Orvis. FishWest - Carries an extensive selection of fly rods, from Orvis, Sage and many others. Has great prices, too. Rivers Edge - Also sells many excellent fly rods, including the Orvis Clearwater Series. Locatd in Bozeman, Montana. Cabela's - Cabela's sells both their own brand of quality rods, along with brands from Sage, Redington, Hardy and others. Trout's Fly Fishing - High quality fly fishing shop in Denver that has a great online store. Sells rods from Thomas & Thomas, Sage, Winston, St. Croix, Scott, Redington and others. Vail Valley Anglers - Based in Vail, this well-known fly shop carries primarily Sage and Scott fly rods. The Rivers Edge - A respected Bozeman fly shop which has an excellent online store. Sells Sage, Winston, Orvis & Scott rods. Front Range Angler - Sells high quality fly rods. Telluride Angler - An excellent Colorado fly shop with an online store. There are many high-quality fly rods available. If you're interested in purchasing a high-end fly rod, the following fly rod brands are suggested. All these rods are available through several dedicated fly fishing shops. Fishwest : Located in Utah with excellent prices.